There’s a Snappy Tomato Pizza basically right outside our front door. Jordan loves pizza – especially the Snappy Hawaiian pizza. They’re always running specials and Jordan will send me a text, “Snappy Tomato is 20% off today” about once a week. He’d order at least weekly, but I usually try to hold him to once a month…and I usually push for the veggie lovers. (I always get outvoted!) I have to admit, the hawaiian is pretty tasty =). 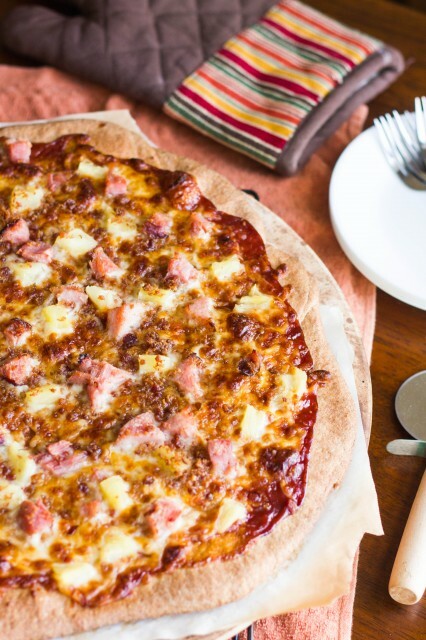 But in an effort to keep it a little healthier, I decided to make a homemade version of the Snappy Hawaiian pizza – bbq sauce, ham, pineapple, bacon, and cheese with whole wheat crust. Homemade pizza is very easy to make and is every bit as good – if not better – than your favorite pizza joint. The key to great homemade pizza is a pizza stone. If you don’t have a pizza stone, you need to buy one! Of course you can make homemade pizza without one, but a pizza stone really helps get a nice crispy crust. Another tip is to use quality cheese – pre-shredded cheese is coated in an anti-clumping powder so I like to shred my own to avoid the chemicals and because I think it tastes better! 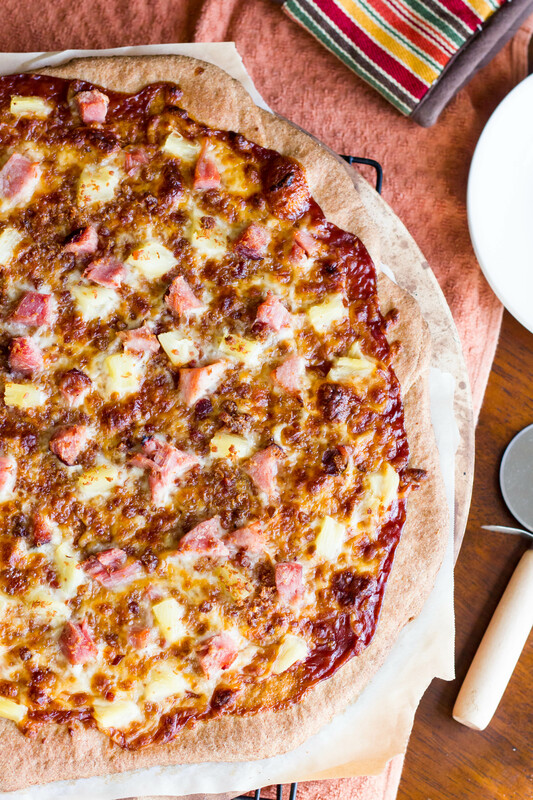 We loved everything about this pizza – especially the nice, nutty flavor the whole wheat flour give the crust – and the combination of flavors from the toppings is spot-on. Delicious! You’ll definitely want to save this recipe for your next pizza night. Enjoy! 1. In small bowl or measuring cup, combine warm water and sugar. Add yeast and stir until dissolved. Set aside for about 5 minutes or until yeast starts to activate. Mixture should look foamy. 2. In bowl of stand mixer with dough hook attachment, combine flour and salt. Add oil and activated yeast mixture with mixer running on low speed until dough forms a ball. Once dough forms a ball, mix on low speed with dough hook for about 5 minutes or until dough is smooth and elastic. Place dough in lightly oiled bowl and cover with kitchen towel or plastic wrap. Let rise until doubled in size, about an hour to an hour and a half. 3. Once dough has doubled in size, punch down and let rest a couple minutes. Preheat oven to 500 degrees F. Place pizza stone in preheated oven. 4. While stone is preheating, place dough on parchment paper that has been lightly sprinkled with cornmeal. Using a rolling pin, roll dough to 12-14 inch circle, depending on how thick you want your crust. 5. Spread barbecue sauce evenly over rolled dough. Sprinkle cheese evenly over sauce. 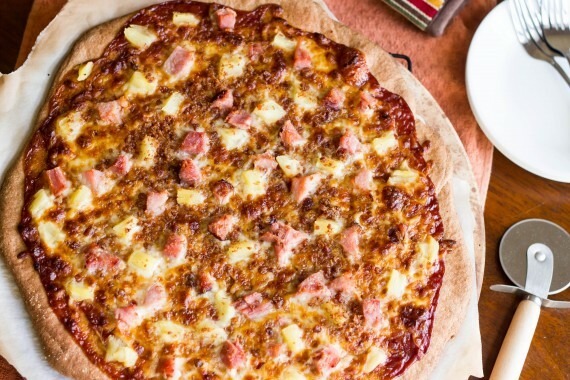 Top with ham, bacon and pineapple. Slide – with parchment paper – onto preheated stone (trim any excess parchment paper so it doesn’t burn in the oven). Bake in preheated oven for about 10 minutes or until crust is golden brown around the edges and cheese is melty. Cut into 8 slices. 1. If you don’t have a pizza stone, you can use a regular pizza pan but your crust won’t be as crispy. 2. If you don’t like whole wheat crust, try this recipe instead. Or this one. 3. If you don’t want to make your own crust or if you’re pressed for time, pick up a ball of your favorite pizza dough from the store. Nutrition Info (per 1/8th): 240 calories; 8.2 g fat; 31.6 g carbohydrates; 4.4 g fiber; 11.4 g protein. Yum! Let’s try this next time we do pizza at Poppy and Granny’s! It’s been too long since we’ve had pizza night :).